If you've £12,500 to £13,500 to spend on a citycar and want it to stand out, then this Toyota Aygo x-cite model might well appeal. Its bright bi-tone yellow paint makes it stand out - and there are all the other usual Aygo virtues too. Toyota goes to extraordinary lengths to give its customers what they want. The company's global success is founded on customer clinics and buying feedback the world over. So when this Japanese brand says it knows what younger budget buyers want, it's worth taking notice. 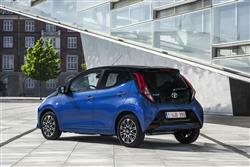 And what they're currently looking for, it seems, is something like this, the Aygo x-cite. The idea here is to make an already quite visually arresting ca stand out further. So x-cite buyers get a smart bi-tone yellow paint job, special wheels and various other matching elements. As a result, buyers can be pretty sure that no one else down their street is going to have an Aygo that's quite the same. There's nothing different beneath the bonnet of course. Like all Aygos, this one gets a frugal revvy little 1.0-litre petrol engine. Let's check it out. 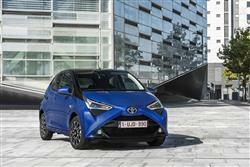 The design of the Aygo is quite striking, something that x-cite trim emphasises. There's bright bi-tone yellow bodywork with custom inserts for the door mirror casings, the front 'X' grille, the front pillar extensions and the rear bumper inserts. You also get 15-inch twin-spoke alloy wheels. The result is a real head-turner. The same colour scheme continues on the inside with the theme continued on the air vent surrounds and carpet mat edging. Otherwise, the recipe is as it is on any other Aygo. This revised Aygo now has a fresher look, with its frontal "X" motif now transformed from a two-dimensional graphic into a more powerful, three-dimensional architectural element. The lower section of the X frames the front grille, while black, gloss black or silver ornamentation beneath the lights aims to accentuate the car's width. This update also includes redesigned headlight units with integral daytime running lights and there are now LED light guides at the rear and revised tail lamp clusters. Inside, there are updated instrument graphics and fresh fabrics. Practicality remains limited, with usable boot space rated at 168-litres, a bit behind the segment norm. Prices for this Aygo x-cite model start at around £13,000, which represents a premium of just under £3,500 over the least expensive Aygo variant in the standard range. In other words, you're really going to need to want the extra kit that comes as part of this package. Only the five-door bodystyle is offered at 'x-cite' level. For an extra £700, there's the option of the 'x-shift' auto gearbox. For £375 more, you'll be offered the option of adding in the 'Toyota Safety Sense' package of active safety features, including a Pre-Collision System, Autonomous Emergency Braking and Lane Departure Alert. Standard kit on this Aygo includes Toyota's 'x-touch' multimedia system, including Bluetooth and DAB, plus a reversing camera. There's also air conditioning, power-adjustable heated door mirrors, driver's seat height adjustment, split-folding rear seats, a leather steering wheel, leather gear knob trim, front fog lights and LED daytime running lights. Toyota has also added high levels of conventional safety kit, which include six airbags ABS with emergency brake distribution, vehicle stability control and a tyre pressure warning system. If you�re looking for a new Toyota AYGO 1.0 VVT-i X-Cite 5 5dr Petrol Hatchback for sale, you�ve come to the right place. At Bristol Street Motors we don�t just have the best Toyota AYGO 1.0 VVT-i X-Cite 5 5dr Petrol Hatchback deals, we also offer friendly advice and help with all your enquiries to ensure your buying experience is a happy experience.